The judges have spoken! 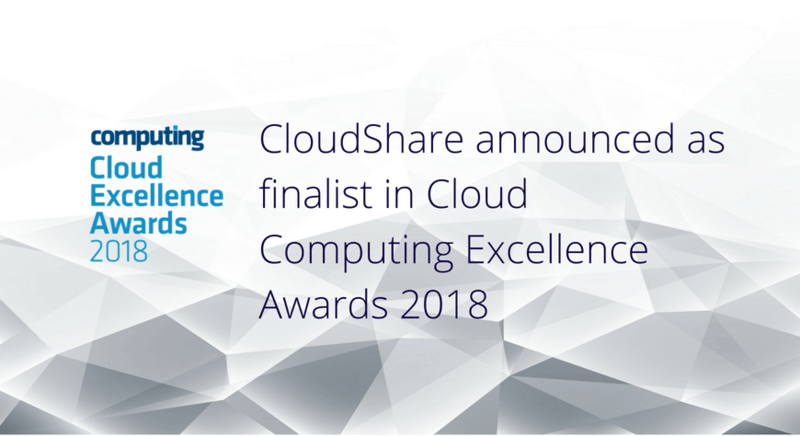 We are proud to share that we have been shortlisted for Computing’s 2018 Cloud Excellence Awards in the category of Best Software – Defined Infrastructure Product, in the good company of Box and AT&T Business Services among others. Computing’s annual Cloud Excellence Awards aim to recognize the very best of the cloud industry, from the most innovative and compelling products and vendors, through to the top use cases from end-user firms. According to Computing: Software-defined infrastructures allow organizations greater flexibility by enabling them to adapt their infrastructure to changing needs. Selected companies in this category demonstrated the greatest functionality, ease of setup and use and level of innovation. CloudShare helps software organizations grow revenue, increase efficiency and improve quality by making it easy to replicate complex on-premise IT environments in the cloud, with specialized solutions for training, sales enablement, and sandboxing for testing and support. CloudShare customers include leading software and cybersecurity companies such as Palo Alto Networks, Atlassian, ForgeRock, Sophos, Check Point, Dell and HP. We’re excited that we have been recognized for our great functionality, ease of use, and innovation, as these are exactly the areas where we excel. Find out why you should be using CloudShare too – Request a demo. Computing is the UK’s leading business technology information resource and a pioneering multimedia brand. The title has been established for nearly 40 years and extends across the widest portfolio of channels in its sector, covering online and mobile versions, news alerts, social media plus a broad range of high-calibre conferences, web seminars, blogs, video and bespoke events. It also runs the most successful awards programme in the UK IT industry.